Lauded loudspeaker manufacturer Paradigm introduced its new Persona flagship speaker lineup back in 2017 as a replacement for the long-revered Signature Series speakers. Back in the day, the top-of-the-line Paradigm Signature S8 last sold for about $9,000 and was a reference speaker for our publisher, Jerry Del Colliano, in his last home in Los Angeles. The new flagship offering from Paradigm, the Persona 9H, is a hybrid powered speaker, meaning that many of the lower frequency drivers come with their own amplification. You get to pick your own sweetheart amplifier for the highs and mids, be it a sweet Class A Pass Labs solid state number, a single ended triode tube amp, or (perhaps more obviously), one of the many high-end Class AB amplifiers from Paradigm sister company Anthem. These new reference speakers retail at $35,000 per pair and put Paradigm into new territory in the high-end market. But the 9H isn't the only speaker in the Persona lineup. The Paradigm Persona 5F, reviewed here, is a somewhat more affordable floorstanding speaker that, at $17,000 per pair, is positioned below the aforementioned hybrid 9H and the non-powered 7F in the Persona line, but above the smaller 3F floorstander and Persona B bookshelf. The Persona 5F is a five-driver bass reflex design that most notably packs the Beryllium tweeter that made the Signature S8 such a hit, along with a Beryllium mid/bass driver. The speaker delivers a reported 93 dB efficiency and low frequency extension of 23 Hz, and comes in a crayon pack of standard finishes, as well as the option of bring your own custom finish to the equation. The first thing you noticed when unboxing the Paradigm 5F is the simply fantastic fit and finish of this stunningly modern-looking speaker. The old Signature Series speakers came with an acceptable wood finish for their price, but my Persona 5F review samples came in an eye-popping Aria Blue, one of the available high-gloss metallic finishes that makes the speaker look like they were painted next to a new Aston Martin. The sleek, angular design and immaculate build quality wouldn't be out of place on an Aston either. Each Paradigm Persona 5F weighs in at a substantial 95 pounds, mostly due to the trio of seven-inch woofers that handle the low end. Arguably the biggest upgrade to the Persona line of speakers is the use of Beryllium. A number of high-end loudspeaker manufacturers use Beryllium in their tweeters, to get that high degree of clarity and sparkly texture to high frequencies. But most revolutionary is Paradigm's choice to use it in both the tweeter and the seven-inch midrange driver. I hooked up the Persona 5F speakers first to my usual reference system, including a Parasound Halo JC2 BP preamplifier and Crown i-Tech HD8000 amplifier. During the course of the review, I also subbed in Anthem's STR preamplifier and amplifier combo for some additional listening. I cued up "Get Lucky" from Daft Punk's Random Access Memories album (88kHz/24-bit FLAC). I was immediately struck by the clarity of the highs via the Persona 5s. Pharell Williams' high pitched vocals sounded crystal clear, but not scratchy or metallic as I've heard from a number of tweeters that included exotic materials. The tweeter here even bests the performance of the RAAL ribbon tweeters on my reference Salk speakers. The background rhythm guitars were bright and struck with a crisp immediacy yet no sense of harshness. This was followed by deftly handled decay. Another thing that really caught my attention was how seamless the transitions from highs to midrange were. The only other two-way or three-way designs I've heard that could achieve this level of seamlessness were the concentric tweeter/midrange design on higher-end KEF speakers. The bass on the funky track sounded tight and musical but not earth shaking. In order to go the full Monty, I added my SVS PC-13 Ultra subwoofer and engaged Anthem Room Correction (ARC) via the Anthem STR stereo preamp, and we went deep. Really deep. Next, I spun up Star Wars: Episode III--Revenge of the Sith (Blu-ray). Dialogue was refreshingly clear and audible through the pair of speakers. The soundstage was so wide and deep that in the Anakin/Obi-Wan fight scene near the end, it really gave me that sense of being in a large, cavernous lava pit on planet Mustafar. The background music, showcasing John Williams' masterful direction of the London Symphony Orchestra, was dynamic, thrilling, and engaging despite the fact that I was listening in mere stereo. The lush, rich sound of the orchestration was as good as I've heard, be it in the theater or any of the other permutations of my music playback system. While some of today's high-end audiophile speakers require gobs of power to perform their best, the 93-dB sensitive Persona 5F speakers rocked equally well with my Crown, the recently reviewed Anthem STR, and any other amplification I threw at it. Basically, you don't have to worry about having 400 watts of power to light these Paradigm Persona 5Fs up. The Persona 5F remained very neutral, beautifully handling every genre of source material, be it classic rock, large scale orchestral music, bombastic movie soundtracks, or anything else for that matter, without adding or subtracting its opinion or own specific sonic flavor. In fact, these were some of the most neutral speakers I've ever heard. The Paradigm Persona 5F features crystal clear highs and mids thanks to the use of Beryllium drivers for all but the deepest bass. The 5F is about as neutral as any speaker I've heard, and that is indeed high praise. Its high sensitivity (93 dB) makes the Persona 5F easy to pair nearly any amp you might want to use, even those tricky, low-watt power amps that will roll over and die if you ever tried to use them with other speakers this large. The soundstage of the easy-to-place Paradigm Persona 5F is yet another gleaming benefit of these speakers. The Persona 5F deliver some pretty low bass, but not the sort you would get by adding a good subwoofer and some decent room correction to the mix. The Paradigm Persona 5F is modern looking speaker that looked great in my décor but might not match everyone's taste. Changing colors could solve that issue, but they are a pretty stylized, architectural bit of industrial design that may not appeal to the guy (or girl) who is looking for the more traditional look that you can get from other high-end audiophile brands in this price range. At $20,000 per pair, the Focal Sopra No. 3 also features a Beryllium tweeter design and similar build quality and aesthetics. With the Focals, the bass extension is far more noticeable from the stereo speakers as compared to the Persona 5F. Sometimes sibling rivalry is the fiercest competition of all. One step down in Paradigm's own Persona line, the 3F packs quite a punch. At only $7,000 less per pair, the 3F utilizes the same tweeter and midrange as it's sibling, the 5F. You can read Dennis Burger's review of the 3F here. Lastly, the new Revel F228Be offers performance many are already raving about for $10,000 per pair. HomeTheaterReview.com will have a review of a Beryllium tweeter Revel speaker system in the near future from Brian Kahn. The Paradigm Persona 5F is easily one of the best performing speakers I've heard. It is a "perfect 10" on most elements of sound that music lovers and audiophiles alike care about most: soundstage, neutrality, refinement, impact, and cohesion. The speaker market from $15,000 to $20,000 is the type of place where your expectations should be high. You can ask for (and get) pretty much anything and everything that you want from a pair of high-performance stereo loudspeakers at or around this price. In the case of the Paradigm Persona 5F speakers, you are getting some of the best engineering the loudspeaker world knows with a fit and finish that you might expect from speakers costing twice the price. The Beryllium drivers are a welcomed addition to the value proposition, but of course you are paying for that in the $17,000 price tag. Simply put, the Paradigm Persona speaker line and specifically the 5F has put the other brands on notice. 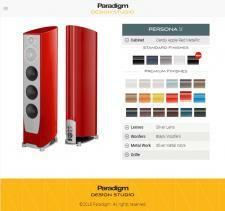 • Paradigm's Persona Speakers Now Available In More Custom Colors and Grills at HomeTheaterReview.com.